Lots of birds, and lots of cover for them. Alan and I met the bird watcher in the parking lot of the Big Morongo Canyon Preserve a few miles north of Palm Springs. He was sitting on the tailgate of his car, a thin gray man in full birding gear: Tilley hat, multi-pocket vest, high-powered binoculars. He looked tired, and not very friendly. We said hello, and asked if he’d seen any birds. We wished him luck and set off to hike the preserve. 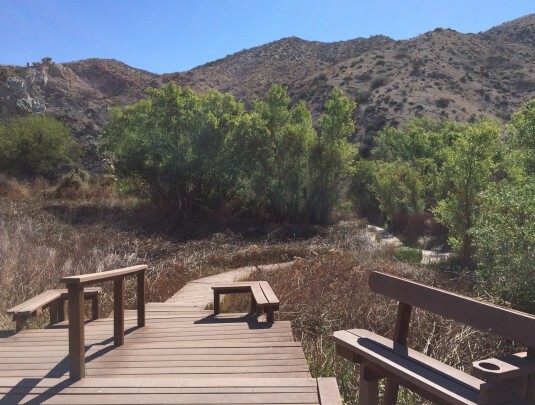 At its heart lies a small wetland, a lush green valley at the base of dry desert hills. Bewick's Wren, at attention, as ever. As we walked on the boardwalk in the bushy part of the preserve, we encountered two Bewick’s Wrens, facing each other from separate bushes, tails as upright as small territorial flags: much chatter, a chase, and then they disappeared. Where the trail moved out into the dry hills, flocks of White-Crowned Sparrows, cousins of the ones who spend their summers in the parking lot across the street from Yoga on 7th, foraged on ground that looked as barren as asphalt. Then we saw something we couldn’t identify: a glossy bird perched on the top branch of a low-growing tree. It could have been some kind of blackbird, except for the crest and the red eyes. We rejoined the marsh trail, with its even boardwalk, and there, on a bench, sat the South Carolina bird watcher. I asked him what birds he’d seen. I mentioned a small yellow bird we’d glimpsed a short way down the path, but didn’t get a good look at, since it was wisely taking advantage of the cover. Then I walked on, wondering how it was possible not to be glad under a blue dome of a sky, in a lush oasis filled with bird song. 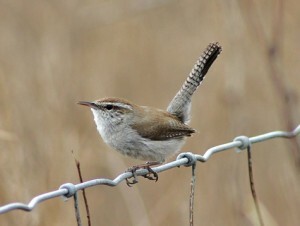 Isn’t a Bewick’s Wren miracle enough? 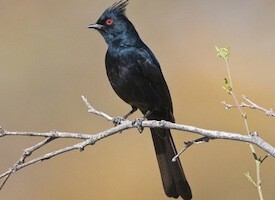 Phainopeplas eat more than 1,100 mistletoe berries a day, each, when they're in season. Back at our temporary home, I scoured the bird book, while a male house finch with a flaming red breast – we get them at our feeder too – sang from the highest spike of the nearby Ocotillo cactus. I couldn’t find the shiny black crested bird. Nothing even came close. I was ecstatic, not least because Phainopepla is fun to say, and I can make Alan laugh now, almost any time, by gazing at him intently and saying: “Phainopepla.” I don’t keep a life list – a list of all the birds a birder has seen – but if I did, I’d have been very happy to add my first silky flycatcher. Yoga practice can sometimes be like birding. It’s only natural to want a long life list, to be eager to learn new poses, to believe that novelty trumps familiarity. The poses we know well can be like birds at the feeder, welcome, but no longer commanding rapt attention. 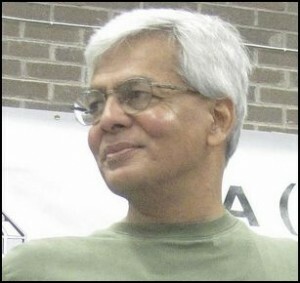 Jawahar at a conference in Glasgow in 2011. My first day back home in Vancouver was the first day of a weekend workshop with Jawahar Bangera. Jawahar has studied with B.K.S. 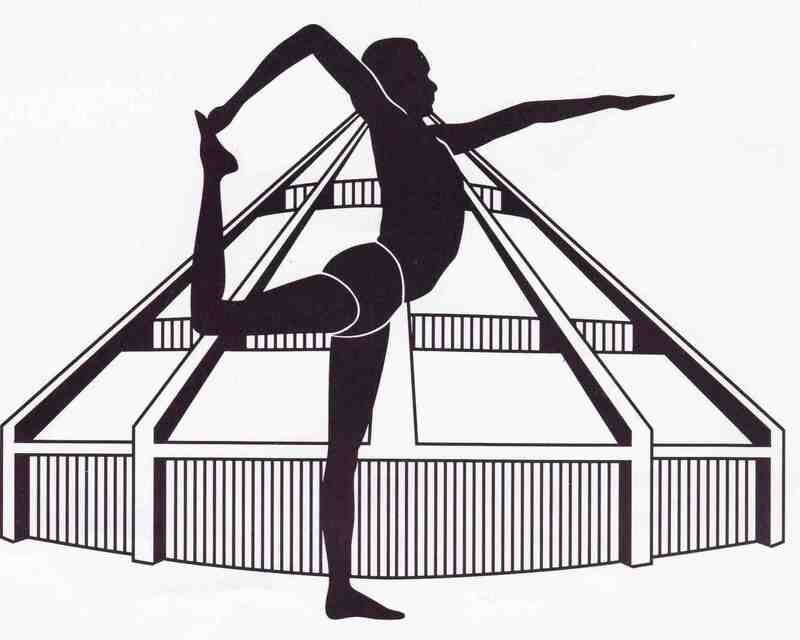 Iyengar since 1969. 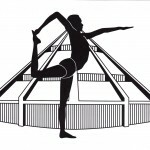 The poses were simple, and all familiar: Tadasana, Trikonasana, Parsvakonasana, Supta Padangusthasana, Paripurna and Ardha Navasana. Every pose we did was on the introductory syllabus. And every pose was also new, including Tadasana, simple standing. Jawahar wanted stronger, straighter arms than I’m used to creating. The deltoids, at the top outer arm, were to set the arm bones into the shoulder sockets. Then the muscles, particularly in the inner arm, were to stretch to the floor. “Tadasana is to show you how compact the body can be,” he said. I’m as likely as anyone to adore a new pose, or a new bird. But show me new facets to an old familiar pose, and I’ll follow you anywhere. 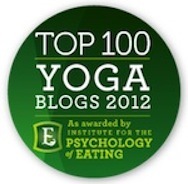 As I’ve worked with my transformed Tadasana over the past week I’ve learned something. If you make your arms completely straight and strong in Tadasana, when you take them out sideways to move to another standing pose, you’ll feel enormous power in your arms. Seems there’s never an end to learning about familiar birds, or familiar poses. Seen any good birds? Rediscovered any poses you thought you already knew? I’d love to hear about it. How is a yoga pose like a Russian Matrushka doll? I’m glad you enjoyed it. Thanks for commenting. Incredible insight! I just repeated this and I felt this tremendous power immediately! But now I feel my legs are left behind! Do you have any similar recommendation for the legs? By the way Jawahar was my first real teacher also! I think he built a good base from which I have progressed. How fortunate for you to have worked with Jawahar. Such clarity and strength. His recommendation for the legs was to bring the same compacting action to the hips, pulling inward from the top thighs. I’ve been working with this too, and am finding that my Warrior III is getting stronger.